If we were playing a word-association game, perhaps when I say “spring,” you think “cleaning” or “thaw” or “rain” or “flowers.” Well, around here, when someone says spring, we think “decking.” Spring for us means that our millwork department will be using the majority of its time — about ¾ of each day — grooving Ipe decking boards for hidden fastening systems. 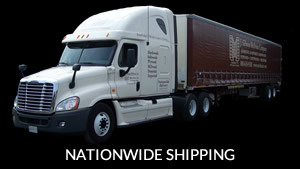 On a daily basis, trucks are being loaded with Ipe and other tropical hardwood decking lumber to be shipped to our customers located at all points across the country. While Ipe remains unrivaled as our top-selling decking lumber species, its rising price point keeps us seeking out alternative species to recommend to our customers. So we’d like to take a brief look at the top 3 recommended hardwood decking species that we carry. Ipe is popular and for good reason. 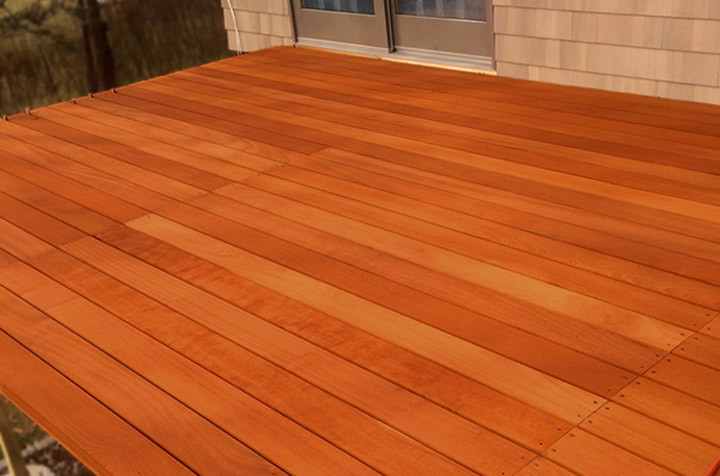 Despite its price point, Ipe remains our number-one pick for hardwood decking. With borderline magical properties, its superior strength and stability make it truly ideal for any setting or exterior use. Because Ipe requires no extra drying time, it can be easily shipped to our lumber yard for grooving and then to your job site in a relatively short amount of time. When we receive Ipe from South American mills, it typically has a moisture content between 12-15% and demonstrates exceptional stability. Strong and durable, Ipe decking is used for residential decks as well as for public boardwalks with absolutely amazing longevity. 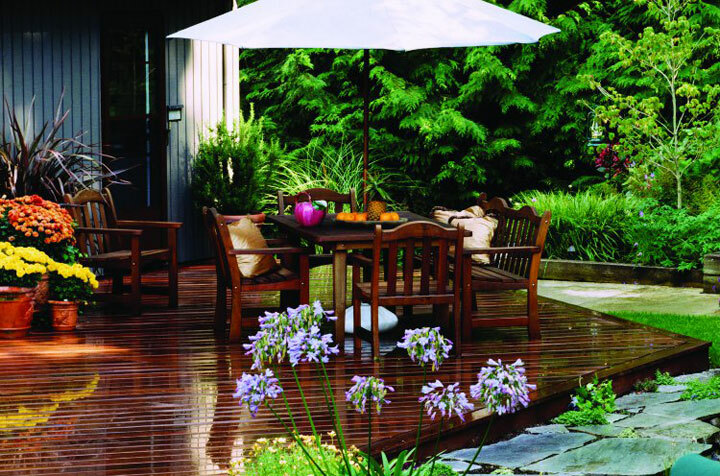 Only slightly softer than Ipe, Cumaru is another exceptional choice for tropical hardwood decking. Sometimes referred to as Brazilian Teak, Cumaru comes in two color variants: red and yellow. 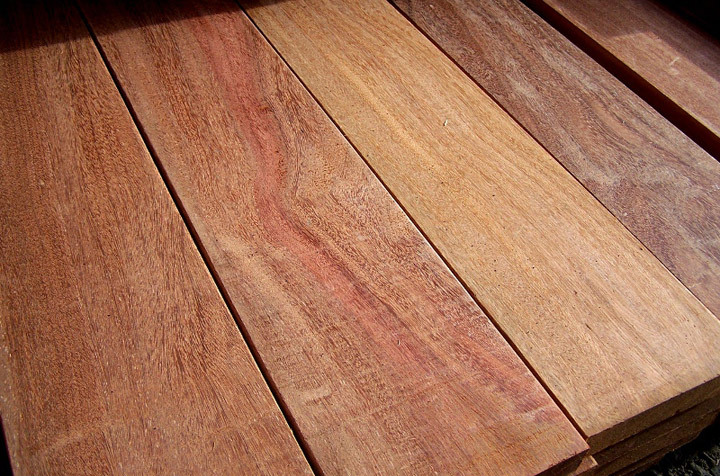 More commonly used for decking, the red variant of Cumaru appears quite similar to Ipe. You should be aware that Cumaru can have some issues with stability and shrinkage, so kiln drying is a definite necessity. Further, using Cumaru in a climate that’s particularly dry can create problems. If your job site is favorable to Cumaru, though, you’ll probably be able to enjoy the lower price point (think 67% of the cost of Ipe) along with similar hardness and density. Easier on tools than many other tropical hardwood species, Red Balau also demonstrates great durability and hardness. (For a domestic species comparison, Red Balau is harder than Hard Maple.) This fabulous species is in the Mahogany family, allowing it to demonstrate texture, workability, and coloring similar to those long-appreciated characteristics of Mahogany. Other benefits of Red Balau include a remarkably low amount of defects along with a high degree of color consistency. Priced around 50% of the cost of Ipe decking, Red Balau is a bargain. While it can be more difficult to source, J. Gibson McIlvain keeps an inventory of Red Balau ready to ship to your job site in time for your next decking project. Of course, those 3 top sellers aren’t the only tropical hardwood decking species that we recommend or carry; they’re just our top picks. Be sure to read our next post for details on 4 more species to consider. 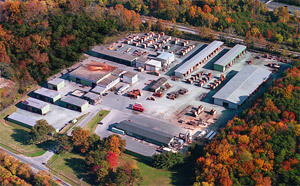 As an active supporter of sustainable lumber practices and one of the largest U.S. importers of exotic woods, the J. Gibson McIlvain Company has provided fine lumber for notable projects throughout the world, including the White House, Capitol building, Supreme Court, and the Smithsonian museums. When Is the Best Time to Buy Ipe?